The Legend Of The Five Rings Live Action Role-Playing Game is a set of theatre-style larp rules for the Legend Of The Five Rings tabletop roleplaying game. The game uses a simple card draw system to resolve tasks, with multiple tests in combat for initiative, attack and defence, and damage. Character creation is points-based, with characters purchasing traits, and skills. 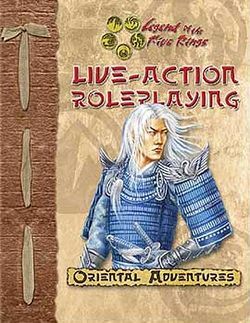 The book contains extensive information about the L5R setting and its culture. This page was last modified on 23 June 2015, at 07:15.